For my card, I used a NBUS Darice palm tree embossing folder for the rose-colored circle which has a stitched embossed line built into the die from Lil' Inkers Designs. The circle is really much pinker IRL. The little sun circles are also by Lil' Inkers Designs. The congrats sediment is from Papertrey Ink. The washi tape strip is from Freckled Fawn and the charm is from American Traditional Designs. 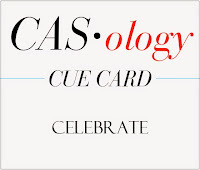 First, there is CASology, which is celebrating 100 weeks of challenges! This is a popular and challenging cue card word challenge and I've rarely missed a week of fun! Congratulations to the fabulous Melissa and the entire talented Design Team! This week, of course, the word is "celebrate!" My little charm says it all! The third challenge is AAA Cards. This is a relatively new challenge in Blogland that I've been wanting to play in since they started. This challenge is their seventh and it is "Create" week where we are to use a technique. The technique this time is "embossing" and, additionally, we are to use some pink on our card. There are a few other challenges that would also work for my card, but The Paper Players challenge rules are that we only link to three challenges, so that's all I'm entering. Please click on the links to join in the challenges and to find all the details about rules, sponsors, and prizes! It makes me so happy to introduce you to the next group of five new Playhouse friends, some of whom have ridden over on the NBUS! Kim of Kim's Cards & Crafts. Kim has been blogging since 2009! She is a published and award-winning card artist and designer. Her cards are bright and beautifully made. In addition to cards, Kim enjoys cake decorating, embroidery, cross-stitch, sewing, and quilting! Sarah of Mallows Crafty Bits. Sarah has been blogging since 2012. She is a delightful award-winning card artist and design team member. She also knows her way around animals, fabrics, her camera, and her kitchen! When she's not doing all that, she works part-time to support her crafty addictions! These next three bloggers are all new to Blogland as of 2014! You know I love it when you make a special effort to welcome our newest bloggers to this very friendly and supportive stamping community, which can nevertheless be very intimidating to start with. Rachel of Rachel's Card Corner. Rachel is newly married and started her blog in April. She is very enthusiastic about her craft and she makes darling cards! Judy Woodland of Judy's Happy Place. Judy just started her blog in January. She is a wife, mother, and grandmother. Besides making her wonderful cards, she loves to knit, crochet, cross-stitch, bead, and work with stained glass! Gracie CH of Graciellie Designs. Graciellie has also been blogging since January. She was born in Brazil and moved to Central America at an early age. She is multilingual and very talented. Her style and elegance is evident in her beautifully constructed cards! Thank you very much for joining, ladies, and welcome to the Playhouse! Thank you for your overwhelming support and enthusiasm! Fab card, Darnell, lovely sunshiney feel to it! This is gorgeous Darnell love the bright colours!! Oh I love those palm springs...which I could go lay on the beach and read a book under some! Super card!! It's so happy! Love the card Darnell. A sunny bright creation. My followers reading list has been down. Blogger R.I.P. Will comment as I can. Cute card and perfect for someone that's retiring! What a great card, Darnell! You worked the sketch with your magic and it is awesome! BTW...I forwarded your directions about posting more than one card to a post to TWO more crafting ladies! I sent them your way...Marlena and Helen! I am sure they know you! The embossing folder rocks Darnell! Love the happy sunshine feeling on this card! Wonderful card Darnell. I love the sunny colours and fabulous design. Sorry I haven't commented in a while, things are still hectic for me at the moment. Hi Darnell, Thanks for visiting my blog. Gorgeous and fun card!!!! What a darling card. It's perfect for a retirement card. Love the fun feel it gives off. Oh so cute and cheerful!! She will LOVE it!! This is one great retirement card! Nothing could be more fun that palm trees, warm sun and summer colors! NJ! And who wouldn't like the thought of palm trees and sunshine . . . any time of their life! Great card, one to make you dream even if it can't be a reality. What a fun card to celebrate a retirement. Super cheerful retirement card. Got to wait a good few years before I get me one of them but after a busy shift at work today, I wish it was sooner, lol ! What a fun embossing folder. Cool card and your friend will love it. I really love the fun, bright colors you chose for this card, Darnell! The embossed palm trees are fabulous, and I love all of your stitched elements! It's perfect for retirement, too...I'm sure your friend is going to love your thoughtful, beautiful card! I love the bright, tropical feel of this! Great retirement card! Fun embossing and very appropriate! 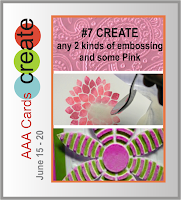 Your friend will love this fun card - Thanks for joining in at AAA! What a super fun and bright card you made for your friend. Palm tress and sunshine sound perfect right about now. Thanks so much for playing along at CASology and helping us celebrate 100 challenges this week. What a fabulous summery card! Perfect for someone retiring! So much fun!! Love your newsy way in your blog. You make my smile as I read!! Thanks so much for joining in the fun at AAA Cards! Love having you there. What a cheerful retirement card!!! Love a retirement card that's not all soupy and melancholy! This is so bright and cheerful just as retirement should be! Needless to say I am loving retirement!!! Have a great day Darnell -- Need to get my NBUS card done -- way behind! Fun, fun card Darnell! I love your card, it looks like a day in paradise. Your card is so bright and sunny - a perfect happy day card! Darnell! A big smile and hug from me for joining us at AAA challenge! Your card is perfect for your retiring friend... AND for our challenge! Your retirement card for Nancy definitely suggests palm trees sunshine and celebrations to me Darnell, it's a gorgeous, happy and colourful card and I wish Nancy a happy retirement too. Love the memos on your work desk pic, the same could be said for my place only with the addition of nose art on my window from my cats!. I hold my hands up, cos I would so be guilty of nipping over your fence and helping myself to those chocs. Almonds and chocolate Mmm, Mmm yes siree! Lovely card there Darnell. I would love to have palm trees and be retired. Not a chance of either here in Wales! Thank you for your message yesterday and your lovely card. I had a lovely day and had a small hangover to prove it this morning! Love this retirement card Darnell. Your friend Nancy will surely enjoy this tropical destination! Congrats to her. Yay, Darnell! So happy you are playing along with our 200th challenge at The Paper Players! You friend is going to love this card. Those die cut sunshines and embossed palm trees are fab. Great colors too! Hugs! What a bright, fun and happy card Darnell! Love the embossed palm trees and sunshine...so glad you could celebrate our 200th with us! Happy and bright! The best! Darnell, what a great endorsement from you with this beautiful retirement card. I love that you've joined us at AAA cards! Thank you! Finally made it to your blog after being gone. Fritz is really slowing down my catch up time--he needs so much attention at this point. Anyway, this is such a great retirement card--wish it was for me--LOL! Love the stitched suns! I'd be more than happy to retire someplace with sunshine and palm trees...oh, look, out the window! Sunshine and palm trees. I'm sure the boss won't mind. See ya! Hope you are enjoying a terrific week!, love your bright and cheery card! I love the embossed palm trees! What a fun, cheerful card--I am especially happy that you used my sketch as your starting point...I think some people found it intimidating, LOL! Thanks for helping us celebrate our 200th challenge with this beauty! Retirement is such a huge change, I'm sure your hints of an island oasis will be well appreciated. Love the colours you chose and all those gorgeous die cuts, it will be a hit with her I'm sure! Love the fun sunny colours in this card. Your die cutting and embossing is the tops! I must try something like this myself. Well done! Darnell, this is just about the most cheerful "congrats" card I have ever seen! I almost needed to put on my sunglasses just to take in all the bright, cheerful elements at once! I love how you incorporated the "celebrate" sentiment, too. 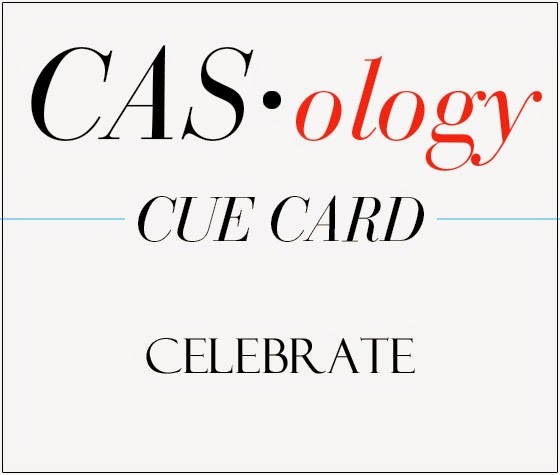 Thanks for being a constant supporter at CASology...and thanks for helping us celebrate this week! So fun, bright, and cheerful - the way all cards should be! Hugz! Seeing this card really, REALLY makes me wish I was Nancy! Sun, palm trees, retirement and a frosty cool beverage (that I'm sure is hiding behind the palm trees!). Awesome job pulling the colors from the washi tape into your design! LOVING this bright and cheery card, Darnell! Funnily enough I made a goodbye card yesterday with a palm tree in a circle (although I forgot to take a picture of it). Great minds huh? :) I really like the embossed palms and how perfectly the congrats fits in the circle. It all rocks! Thanks for playing along with CASology this week! I used a lot of emoticons in my sms and in my networking site. I find it cute and interesting. It portraits on my emotions.